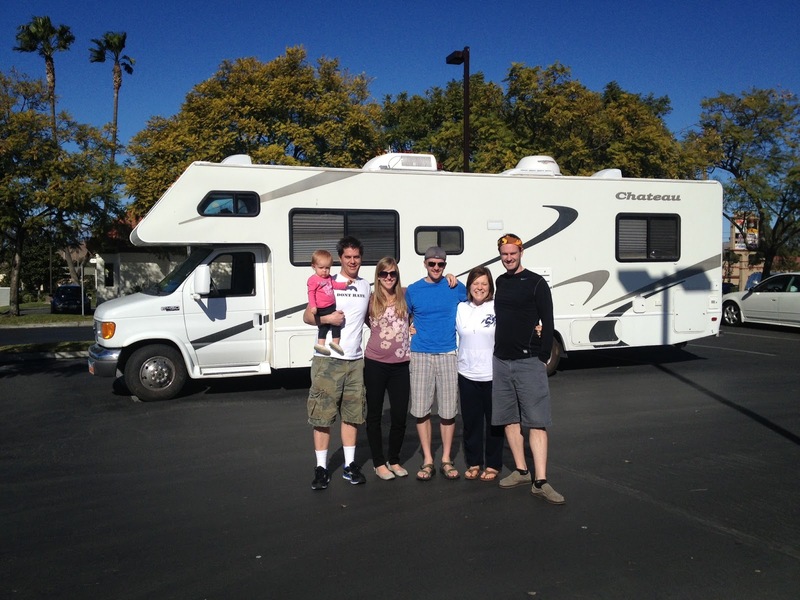 On January 5, 2013 we welcomed a new member of the family - an RV lovingly named "The Chateau". This has been a long time dream of Micah's and he's been looking for one for some time. Of course he found a killer deal and can't wait to share fun, adventure, and variety with family and friends as we discover more of our wonderful country on the road. Our maiden voyage began on Friday afternoon, January 18th. Jeremiah and Dallas joined us and Grauling flew to California where we picked her up on Saturday - now that's dedication to friends and fun. We're so glad that she did! 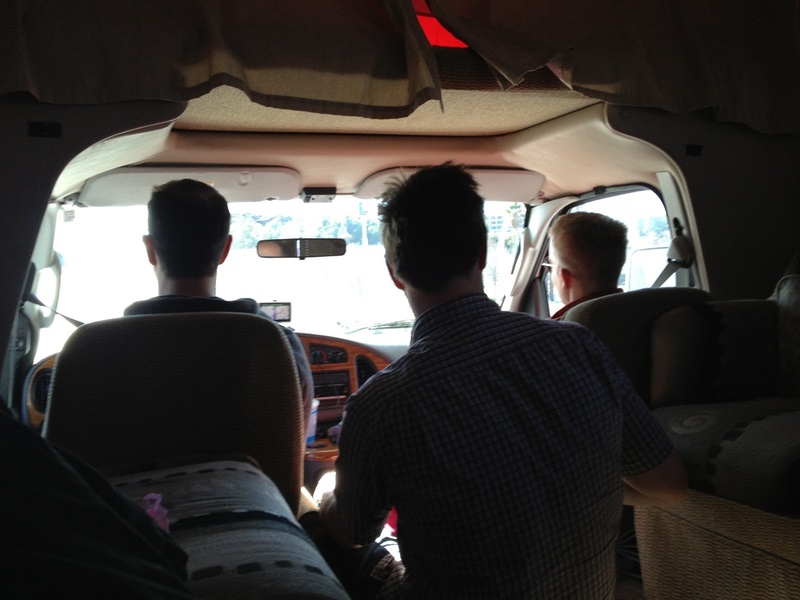 It's good to have these three fellas together on the open road. On the way there we stopped in Las Vegas to go to a buffet with Karl, Carolyn & Lamar (Karl is Big Al's cousin from Ephraim). 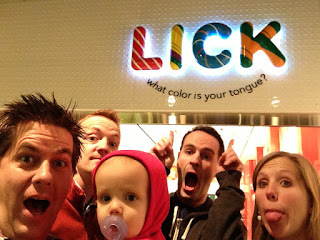 They are some of my favorite people on this planet. They are so good and kind and honorable. I was so glad that we could introduce more of our friends to them because people's lives are made better by knowing them. 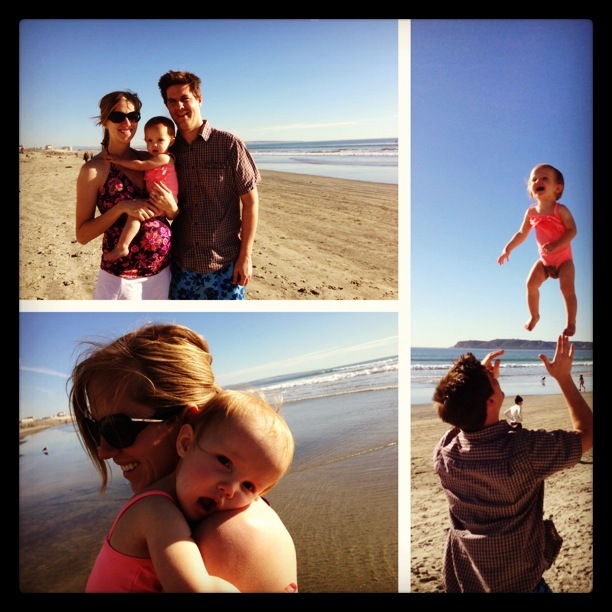 We sure love those Christensens! 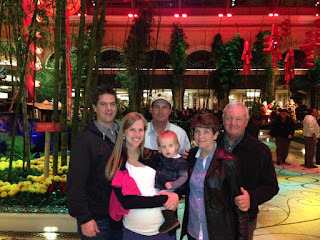 After the buffet at the Bellagio with Karl, Carolyn, and their son Lamar. 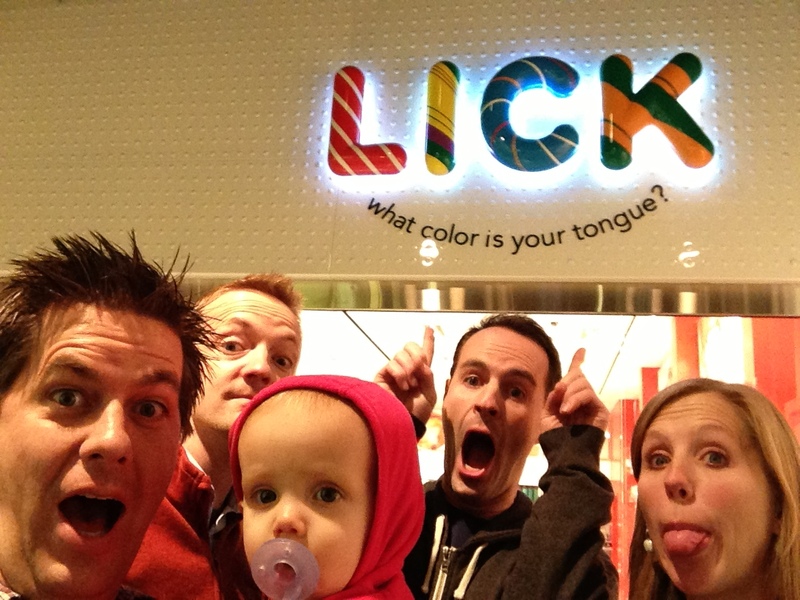 This pic is dedicated to the one and only A-lick-ya. We got a late start from Vegas so instead of going all the way to Cali, we decided to spend the night in a Walmart parking lot in Barstow. We hadn't yet discovered the beauty and luxury of the RV and didn't know that we could have heat during the night without being "plugged in" so it was coooold. Luckily I had brought extra blankets because I'm always cold and Kaylyn was a mini-heater for me as she slept with us that night. Unfortunately, Micah froze and didn't know that I had an extra blanket that I wasn't using. Sad! 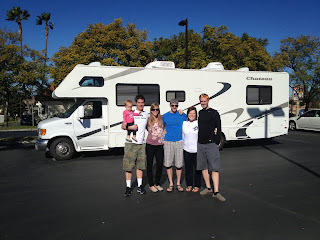 We continued on our journey the next morning and made our first stop at the San Diego airport to pick up Lindsay and complete our RV Family. 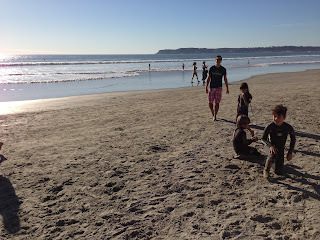 We drove on the coast for a while then finally decided to just grab a bite to eat and head to the beach. It took us a while to decide on our agenda partly because as we were parked on the side of the road near the water we couldn't help but just sit and bask in the warm weather with the RV door wide open and the windows down. 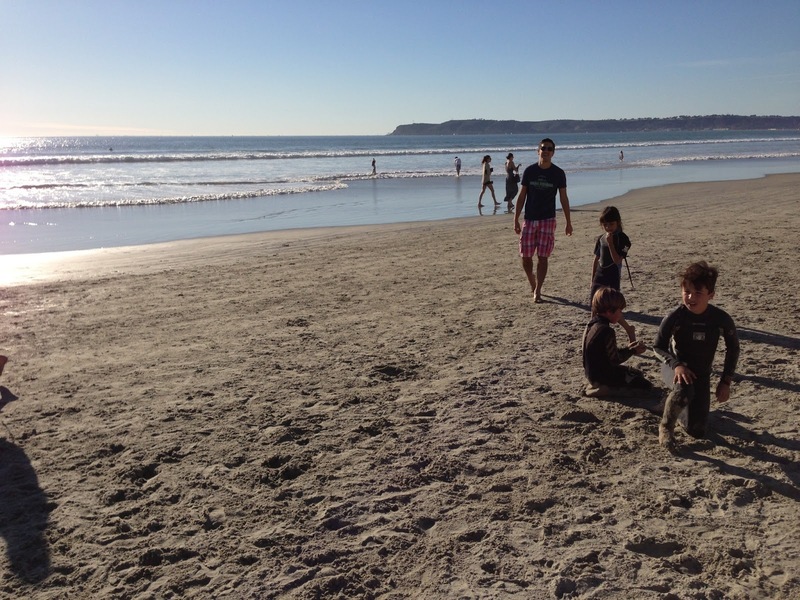 It was so warm and such a nice break from Utah's foggy cold winter. I also had this weird and super intense earache so we considered going to go to an Instacare to get me some relief - it wasn't just any old earache. The night before it was especially bad and hurt so much that I felt like vomiting. After a priesthood blessing from Micah, some home remedy relief - hot corn oil in my ear (online it suggested using olive oil, but they didn't have any in the gas station) and feeling a little better the next day we decided to just call in a prescription and save the $200 visit to the doctor. I began taking the antibiotics that afternoon and the next morning I was a new woman. 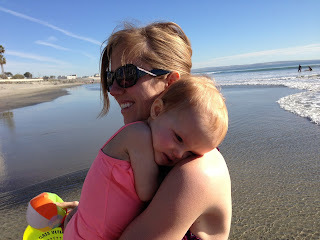 But back to the fun stuff...we spent a wonderful afternoon on the beach. The water was so cold, but Kaylyn loved playing in it anyway. Kids are fearless. 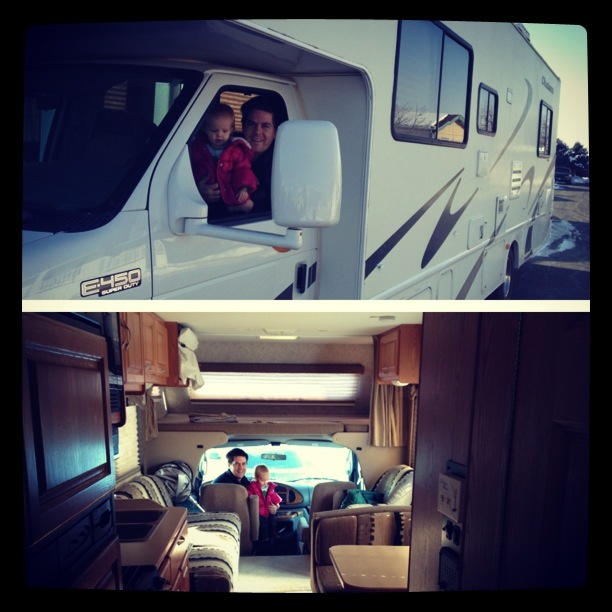 We found a sweet RV Park in Chula Vista complete with free showers, pool, hot tub, and live music the night that we arrived. 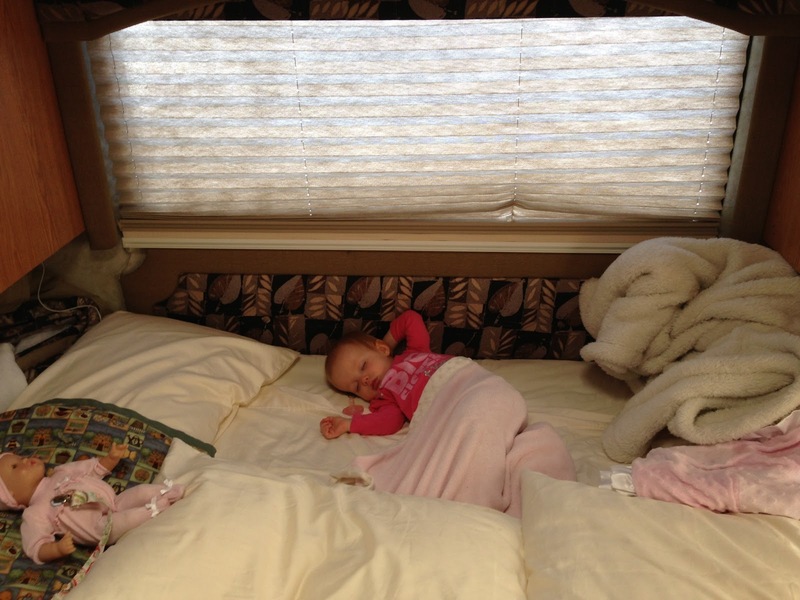 The RV world is totally new to us, but fascinating! When we mentioned to some friends that we got an RV and they jokingly said, "Are you going to visit your grandkids in it?" Yes, the majority of RV owners are in their golden years, but why wait to discover this beautiful country from the comfort of home on the road? 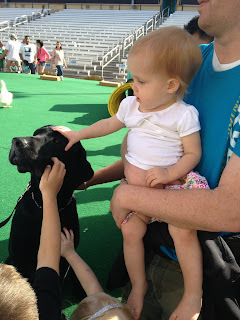 Kaylyn loved the Pet Show! It was full of dogs, cats, and all sorts of animals doing amazing tricks. 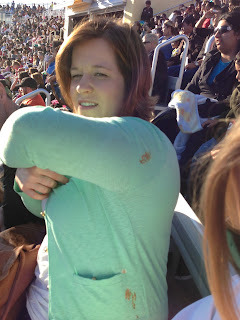 Lindsay and I both got tagged by a seagull overhead during the dolphin show. Yuck! 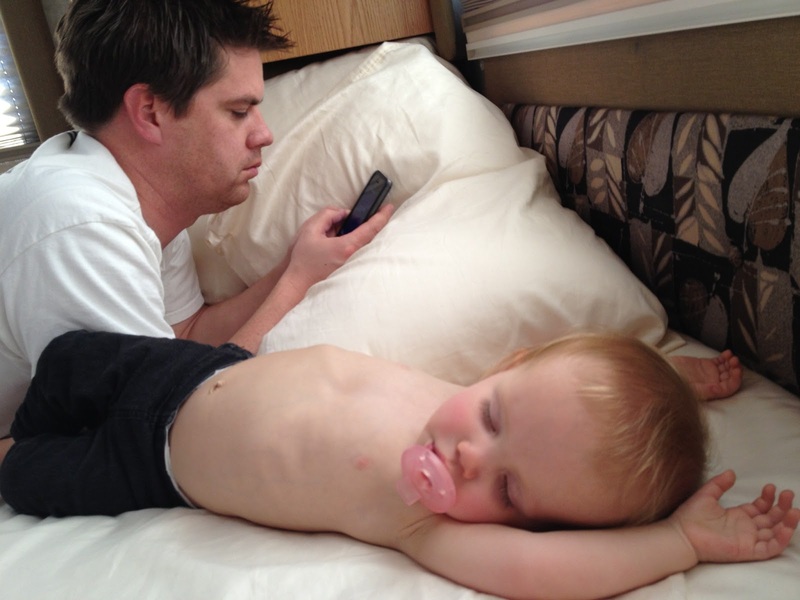 Attempting a family nap in the back of the RV. It's actually really bouncy when you're out on the road so it's hard to sleep. Funny enough Kaylyn slept great back there as her little body bounced all over the place. She's barricaded in all on all sides. 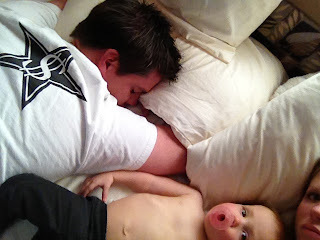 During one nap Micah found her sleeping with her head hanging off the side of the bed. 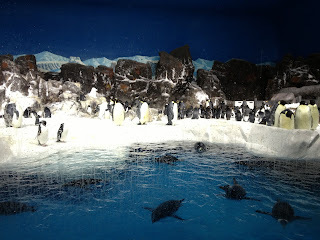 We started to make our way home on Monday with a few stops along the way. For breakfast we ate at McDonald's then In-N-Out Burger for lunch. Healthy, I know. That's just what you do on road trips. 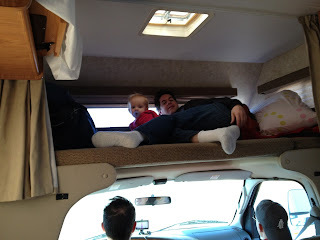 We didn't actually use any of the kitchen or facilities on the RV this trip because we don't know how to yet! After lunch we visited one of Micah's mission companions, Jesse Pricer, at his home for about an hour and met his wife and kids. It was fun to to have the four elders back together - Christensen, Christenot, Young, and Pricer - as they reminisced about New York and caught up with each other's lives. Then we stopped in Vegas again to meet Glade for dinner at a delicious Cajun restaurant. We finally made it home at 3am. It was such a fun trip and so cool to have our home with us wherever we went! The best part is always the people you're with and the good conversation on the open road. Can't wait for the next one!